In our well-constructed warehouse, we store the entire lot under safe conditions and away from various damaging factors such as direct sunlight, moisture, dust, rain and others. We have maintained our high standards in the market by delivering only high-quality products and this is done by using quality raw materials obtained from reliable sources. Sodium laurethsulfate (SLES), an accepted contraction (Lauryl + Ether = Laureth) of sodium lauryl ether sulfate (SLES), is an anionic detergent and surfactant found in many personal care products (soaps, shampoos, toothpaste etc.). SLES is an inexpensive and very effective foaming agent. 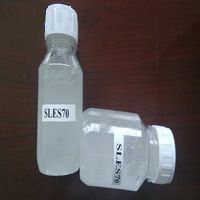 SLES, sodium lauryl sulfate (SLS), ammonium lauryl sulfate (ALS), and sodium parethsulfateare surfactants that are used in many cosmetic products for their cleaning and emulsifying properties.